It has been a bad week at Habitat Aid’s HQ. The spending axe has fallen – again – on renewables – which has effectively now halted the building of any solar farms not in the system from April 2016. Solar site seeded last year. I know this is good news for some folk, but we’d been doing a lot of work for a small number of responsible developers who had gone the extra mile to massively increase biodiversity on previously knackered farmland. The subsidy system has clearly had its problems, but it has meant that a lot has been achieved. Arguably its biggest issue with solar was that it was too successful! The government seems to have been pretty quick on the trigger. When someone like Neil Woodford, doyen of City fund managers, writes an open letter to government about what’s going on you might reasonably suspect a serious issue. Neil is certainly not a left wing anti-capitalist dictating the climate change agenda, which is how Amber Rudd has characterised opposition to her views. The other depressing news this week is the temporary lifting of the ban on neonicotinoids in East Anglia. The chemical involved is precisely the same one which has recently been linked to declines in bee populations in a large scale field trial. Government has also portrayed this as a political issue. In fairness so have the environmentalists. For them the bad guys are large, well resourced anti-environment agribusinesses, served by their pro-business political servants. For government, the ban was imposed against their wishes and the NFU’s advice by interfering EU bureaucrats. The Press perpetuates this politicization. The BBC report I’ve linked to above quotes Paul de Zyla from Friends of the Earth, and Radio 4 interviewed someone from 38 Degrees. These are both left leaning lobbying groups*. At the other end of the political spectrum, the next time I hear Nigel Lawson talk about climate change (or lack therof) the radio is going out of the window. Ditto the next time I hear any environmental policies justified by their benefit to the hard working families of Britain. Er… wouldn’t “short term populism” be a bit more honest? Left or right wing I’d say the same thing. Environmental issues should not be sacrificed on the altar of political dogma. *To declare my interest, FoE are customers of ours. The Tree Bumblebee, Bombus hypnorum, seems to be doing very nicely. They’re called Tree Bumblebees as they nest above ground – in tree hollows or, more obviously, in unused bird nest boxes. This makes them more noticeable than our other bumblebees, which typically nest in old mouse nests or similar underground sites. Compost heaps can be a favourite for Carder Bees, too, which can be rather more irritating than a bird box! Helping on the Bumblebee Conservation Trust stand at garden shows over the last couple of years it’s apparent that people are noticing the Tree Bumblebee more and more. They tend to be a bit more aggressive than other bumblebees (which isn’t saying much! ), with several whizzing around their nest – as pictured – and others looking like guard bees at the entrance to it. They’re easy to spot when they forage as they’re pretty distinctive – they’re ginger (head), black (thorax) and white (bottom). 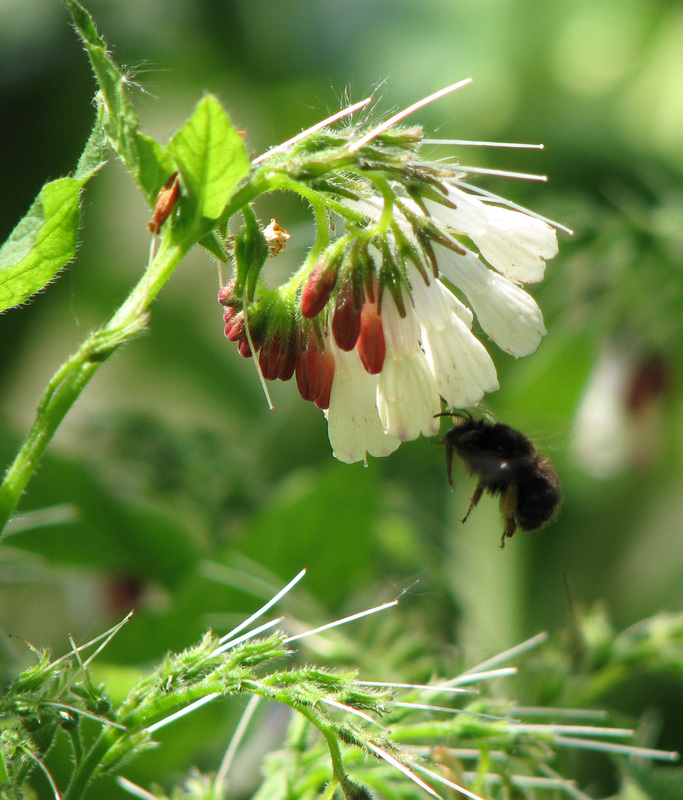 Despite their being short tongued bees they seem to be very adaptable, foraging on a wide range of flowers. What’s nice about Bombus hypnorum is that they’ve only been here since around 2001, when they hopped over the Channel and were spotted in Wiltshire. I would guess they’re now one of our more common bumblebees, despite some folk still claiming they’re a rare new import. Nevertheless, I was still chuffed to find a colony in our back garden in an old bird box, behaving very typically. They’re an interesting illustration of the constant change in our flora and fauna. The Tree Bumblebee seems to be drifting north like other bumblebees, probably as its traditional range is getting too warm. As far as I’m aware Bombus hypnorum doesn’t do any harm, so it’s a benign “non-native” and a distinctive addition to our wildlife. Vive la difference! I’m sure the various campaigns to ban neonicotinoids waged by people like Buglife, the Friends of the Earth and the BBCT are going to carry the day in the UK. I’m confident not least because they are backed by inceasingly persuasive science and, recently, Brussels. A number of retailers have started taking neonicotinoid based products like Bayer’s Provado off the shelves. Parliament’s Environmental Audit Committee is hearing evidence about them too. Just as I thought neonicotinoids were about to get booted into touch in the UK, the agrichemical business is fighting a spirited rearguard action to save them. I wanted to pick up one point in particular from that, which I heard repeated again on the radio this morning by a man from Syngenta. Varroa has been a significant problem for honeybees. These are imported mites which attach themselves between the thoracic plates of honeybees and weaken the bees by sucking hemolymph. They also act as vectors for viral diseases. The European honeybee, Apis mellifera, has been defenceless against them. There are now treatments and ways of managing honeybee colonies which help the bees, and a lot of research is going on in this area. The man from Syngenta said that bee losses were largely a consequence of varroa, not neonicotinoids. This is disingenuous. Recent research suggests the effects of neonicotinoids on honeybees are most marked when in combination with other problems, like the kind of viral diseases spread by Varroa destructor. The key point I wanted to make, though, is this. VARROA ONLY AFFECTS HONEYBEES. There is one honey bee in the UK. As I have blogged before, There are 26 Bumblebees and something over 240 species of solitary bees. Why are they declining? If it’s not varroa what is it? Some of the most persuasive recent research has looked at the impact of neonicotinoids on bumblebees. As for neonicotinoids’ effect on solitary bees (and butterflies, hoverflies, etc. ), well… er… we don’t really know. I did agree with the man from Syngenta when he said that banning neonicotinoids might not halt bee declines, and if it happens there’s a danger bees will disappear off the map of public awareness. There’s climate change, habitat loss, disease, new predators – all sorts of threats which still have to be dealt with. This has been the headline across social media this week, which has been blithely repeated and repeated with increasing excitement as if it is fact. Some bloke in Switzerland has published a paper which suggests that “active mobile phone handsets in beehives noticeably induce the rate of worker piping”, which apparently they do when you put a handset in a hive. This becomes “mobile phones are killing honeybees” in the hands of the Daily Mail, the latest in a line of similar stories which have been debunked. I think there is compelling reason to believe that synergisms between stressors are more problemmatic for a colony than any one stressor. There seems to be a growing body of evidence to support this assertion. Regardless, I think it benefits everyone involved with this issue to look at the data critically and approach these losses reasonably. Apparently Twitter is in a mess this afternoon as spammers have rather brilliantly taken advantage of a flaw in the microblogging site’s security to shunt loads of largely pornographic spam onto people’s desktops. It’s a bit of a relief, to be honest. We (the corporate “we”) Tweet regularly, as the powers that be reckon it’s a good thing for us and some of the folk we promote. I’m not so sure – for a start it’s the IT department (i.e. me) that has to do it. Secondly, I’ve got about a million other things to do in an average day. Last off, what am I trying to do and who am I on Twitter? Originally it was an amusing instant messaging service for fans and friends and used by people like me as a noticeboard, increasingly now for corporates but sometimes for interesting stuff. The communication is sometimes two way but mostly and increasingly not. There’s an awful lot of rubbish on it which gets regurgitated constantly, and you can’t target a potential audience or market. You can’t communicate properly with a group of followers and you can’t prioritise your messages. What chance of someone reading your message when they’re receiving tweets from another 5,000 people? The biggest problem, however, is its original appeal; the lack of reliability and discernment over the messages people chose to post. It’s not so much that nothing worthwhile can be said in 140 characters (I think therefore I am (22)) or that Tweets are of themselves misleading. Most of the damage is done in the links the Twitterati cheerfully carry, however, and in the authority which they consequently assume. A good little example recently – a story about some poor bloke who was attacked and nearly killed by Africanised honeybees in Texas. Apart from bees going extinct, the best bee story is a bee attack story, so it attracted widescale coverage (the Press officially love bees, but they’re also on the list of scary and arcane country things like snakes and eggs coming out of hens’ bottoms and Lib Dem MPs). Anyway, the point is that we don’t have bees like this in the UK. You’re about as likely to be the victim of this kind of attack here as you are of being killed by an adder or an enraged chicken. Or becoming a Lib Dem MP. Unfortunately various well meaning tweeting members of the bee lobby picked the story up as it was bee related, and carried links to it. You know from experience that if you read a story in The Sun it only might be true, but if it’s endorsed by your tweeting bee friend then it’s a cause for real concern. And people are at least sensibly nervous of bees as everyone’s been stung at some point; before long folk are tweeting about the times they’ve been stung, how they were chased by a swarm, how their dog was attacked, etc.,etc.. As if this wasn’t bad enough the same story will pop out of the woodwork all over again in a few months time once it has gone around the virtual globe a couple of times. I increasingly read news stories via Twitter which were news six months ago. If we’re not going to pay for decent journalists and decent content any more we need to learn to be much more careful about who we read and what we’re reading as well as when we’re reading it. We also need to be careful about thinking that the twittersphere and the blogosphere are the real world. Is Stephen Fry more important than the Prime Minister because he has 100,000 more folk following him on Twitter? Perhaps put it a different way; am I one of the most influential people in Somerset because I am one of the top 10 Tweeters by followers in the county? Er… I don’t think so. Entertainment and reality are uneasy bedfellows and increasingly as confused as spin and fact. It’s the people actually doing stuff in the real world who matter.